My friends Morgan and Tim were in a band called Diamonds. I saw them a few times and they were sort of okay. Then some time went by and I saw them again. Somehow in the meantime they had gotten awesome. Then they had to change their name because some band called Diamonds from the 60s was threatening to sue them. Morgan asked me what I thought of Diamond Nights. I said it was perfect, like Baywatch Nights or something. One night I ran into Morgan at 4am and he explained to me that he had just been at the SNL after party. He seemed bewildered by this turn of events, even though it seemed normal to him as well. He was wearing a belt made of bullets, which impressed me. They always seem so large and unwieldy to me, but he was pulling it off well. I suppose that's what minor rockstardom does to you. I haven't seen Morgan for a while so I don't know what's happening. Is Diamond Nights totally kaput or just on hiatus? Has he started a new band? Who knows? 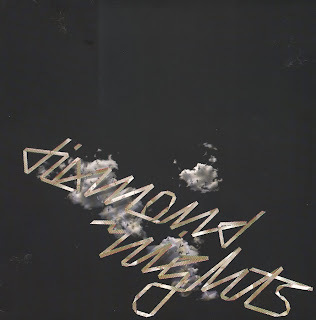 Ladies and gentlemen, for your listening pleasure, a 12" by Diamond Nights. watch him get thrown out of a club in the last hot hot heat video! any chance you have the demo cd they did with the purple cover? I unfortunately do not have a copy of that compact disc. I will have to ask Tim about it next time I see him. They had some great songs that weren't on their records, so I would hope one or two of them are on that.